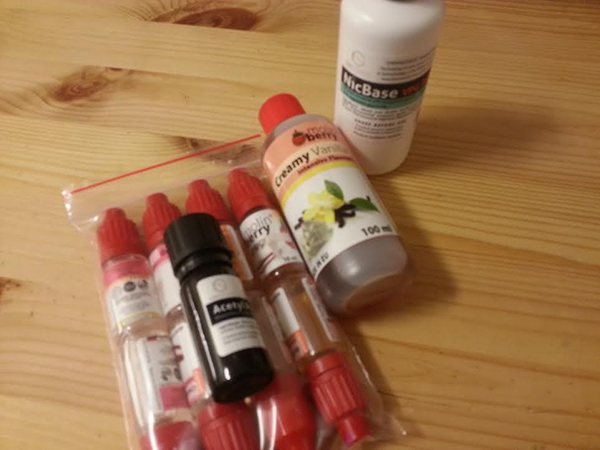 I stumbled upon Molinberry in some forums when I searched for new places to get DIY ingredients to my favorite eliquid recipe Suicide Bunny. Lots of people had good things to say about them so I checked out their webpage and felt they had a thrilling set of flavors so I thought this might be a good time to find new flavors so I can get new favorites to rotate, a good way to lower the risk of getting vapor´s tongue. I picked out some flavors: Creamy vanilla, Pannacotta, Cheesecake, milkshake,caramel, creamy cake, OMG, nut banana och hazelnut. If it tastes good there will be some blogging and reviews. I already started a batch with a flavor they call OMG! that they describe as (Delicious & soft vanilla cupcake topped with cocoa milk cream finished with a hint of chocolate shake). I´m trying to mix it 6% when most people recommended 5-6%.